Wauseon FFA members attended the national convention in 2018. The 2018-2019 Wauseon FFA Officer team consists of, from left, Front Row: Bri Ruby - Secretary, Jozlyn Smallman - Student Advisor, Rachel Lee - Treasurer and, McKayla Clymer - Reporter. Back Row: Trey Schroeder - President, Trent Sauber - Sentinel, and Zevin Gleckler - Vice-President. The Wauseon FFA experienced a busy 2018 that led the chapter to many awards and accomplishments. At the annual FFA Banquet, the new officer team was installed: Trey Schroder, president; Zevin Glecker, vice-president; Rachel Lee, treasurer; Brianna Ruby, secretary; McKayla Clymer, reporter; Trent Sauber, sentinel; and Jozlyn Smallman, student advisor. 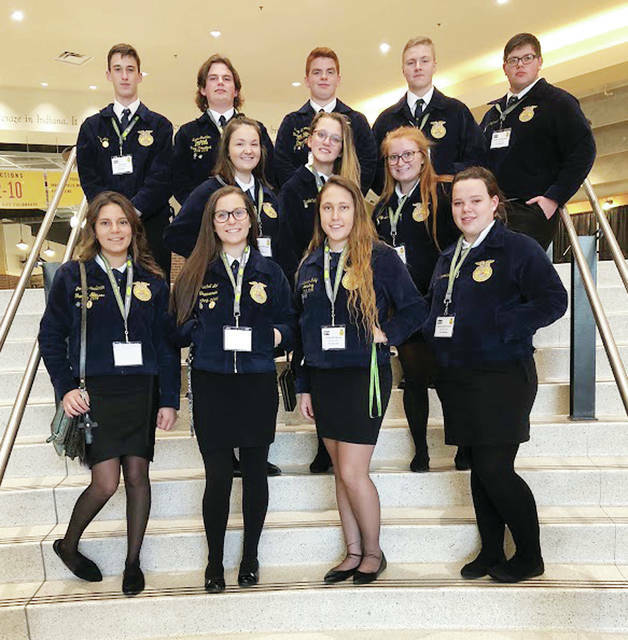 At the annual state FFA convention held last May, 21 Wauseon members attended and took part in many leadership activities and tours around Columbus. Wauseon FFA members receiving their state FFA degrees were Jenna Simon and Alex Pursel. Those that took the time to fill out individualized proficiency awards specialized to their Supervised Agriculture Experiences (SAE) were: Everett Bueter, Turf Grass Entreprenurship; Jenna Simon, Small Animal Care and Production; Mac Warncke, Swine Production Entreprenurship; and Garrett Krasula, Specialty Animal. On the state convention stage, Everett Bueter placed third with his Turf Grass SAE; Cory Johnson and Everett Bueter were recognized on stage for their Gold Ranked Officer books; and Jozlyn Smallman was awarded a scholarship to attend the Washington Leadership Conference in Washington, D.C. in July. The chapter was also recognized for its charitable giving to the Fulton County Heart Radiothon last year. In the spring, the chapter completed its annual Day of Service while partnering with the Wauseon Chamber of Commerce. More than 80 Wauseon FFA members donated over 300 hours of service to over 30 of the city’s businesses. Members competed in a variety of Career Development Events (CDEs) as well, everything from Aquarium Management to Outdoor Power. Top state honors went to the State Aquarium Management Team, at ninth place. Team members included Jenna Simon (sixth place state individual), Kylie Banister, Cassandra Cameron, Jaslyn Johnson, and Bri Ruby. Additionally, the Ag Power Diagnostics Team, consisting of Levi Arps and Tyler O’Neill, placed 10th in the state. Over the summer of 2018, FFA members continued to develop their SAEs and their work skills. The Animal Science facility next to the school was utilized to house pigs and goats that were to be shown at the Fulton County Fair. Students also worked to keep the school farm functioning and worked on projects, many of which were exhibited at the Fulton County Fair. Also during last summer, newly-elected officers went on retreat at the Ohio Caverns and the 575 Foundation in Perrysburg to plan out the upcoming year and bond as a team. Officer Jozlyn Smallman and Trey Schroeder had the unique experience of completing one of the FFA’s intensive leadership events, Washington Leadership Conference. During the first part of the 2018-19 school year, FFA members competed in county, district, and state soils competitions. Sierra Rupp took fifth place in the state’s First Year Junior Division. In the fall, students continued the annual tradition of donating books to Wauseon primary school students, but with a twist this year. Instead of purchasing agricultural-related books, the FFA’s Animal Health class created five different coloring books for the primary students to color and read, then visited the school to participate with the students. The class brought along a three-week-old dairy calf so the students had an opportunity to see one up close. In October, 12 Wauseon FFA members traveled to Indianapolis, Ind., for the 91st National FFA Convention. While there, members attended sessions about leadership and personal growth. They also toured the Spangler Candy Factory, the Sechler’s Pickle Factory and Poe Hamps, a family farm. To close out the year, the FFA chapter awarded Greenhand degrees to the incoming freshman. They included Reece Nation, Keaton Hartsock, Jude Armstrong, Eli Delgado, Sam Smith, Zaden Torres, Austin Aeschliman, Calaway Gerken, Jonathan Spurgeon, Grace Calvin, Madison Rufenacht, Madyson Yackee, Jack Leatherman, Zephaniah Siefker, Zaidan Kessler, Jaxton Fisher, Logyn Batdorf, Kadence Carroll, Brayden Daley, Carson Burt, Jordan King, Deacon Laney, Aliina Lange, Krue Powers, Isaac Ramirez, Jane Richer, Andrew Scherer, Marisa Seiler, Kyle Shehorn, Jayden Snyder, Madison Struass, Alyssa Stricklen, Bryson Stump, and Clay Stump. https://www.fcnews.org/wp-content/uploads/sites/45/2019/01/web1_Wauseon-FF-members.jpgWauseon FFA members attended the national convention in 2018. The 2018-2019 Wauseon FFA Officer team consists of, from left, Front Row: Bri Ruby – Secretary, Jozlyn Smallman – Student Advisor, Rachel Lee – Treasurer and, McKayla Clymer – Reporter. Back Row: Trey Schroeder – President, Trent Sauber – Sentinel, and Zevin Gleckler – Vice-President. 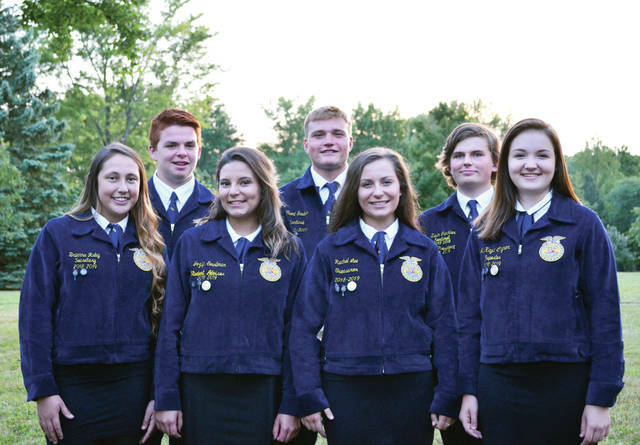 https://www.fcnews.org/wp-content/uploads/sites/45/2019/01/web1_FFA-officer-team.jpgThe 2018-2019 Wauseon FFA Officer team consists of, from left, Front Row: Bri Ruby – Secretary, Jozlyn Smallman – Student Advisor, Rachel Lee – Treasurer and, McKayla Clymer – Reporter. Back Row: Trey Schroeder – President, Trent Sauber – Sentinel, and Zevin Gleckler – Vice-President.